Review current and expected tuition charges for Bryant & Stratton College - Bayshore, in addition to how these costs compare to the U.S. average. Get a good understanding of the tuition charges associated with Bryant & Stratton College - Bayshore in order to prepare yourself effectively for your college years. Check out the stats below to learn how Bryant & Stratton College - Bayshore's cost stacks up to other schools and if you should plan for tuition increases. The following table outlines how Bryant & Stratton College - Bayshore measures up to other schools nationally, regionally and by state. How Much Will Tuition & Fees Be for Bryant & Stratton College - Bayshore? Full-time undergraduates at Bryant & Stratton College - Bayshore were charged $17,013 in fees and tuition for the 2017 - 2018 school year, prior to adjustments for financial aid. Of this amount, the cost of tuition totaled $16,545. The remaining $468 represents additional fees. As opposed to public colleges, Bryant & Stratton College - Bayshore does not offer a tuition discount to students who live in state. Bryant & Stratton College - Bayshore fees and tuition is the amount quoted to students for one academic year, and doesn't include room and board. However, most students will end up having to pay less than full tuition after receiving financial aid and other reductions. Look at the following table to see 2017 - 2018 academic year costs. For more information, check out Bryant & Stratton College - Bayshore Part Time Tuition & Fees. There has been a rise of 2.6% in Bryant & Stratton College - Bayshore fees and tuition for out-of-state students in the past 5 years. Tuition increased by 2.2% and fees increased by 22.1%. This year, students should anticipate paying $17,457 if the growth keeps up. Because of price increases, the full cost of a four-year degree will be $72,610, and the full cost of a two-year degree would be $35,370, which doesn't include additional costs such as books, transportation, and room and board. 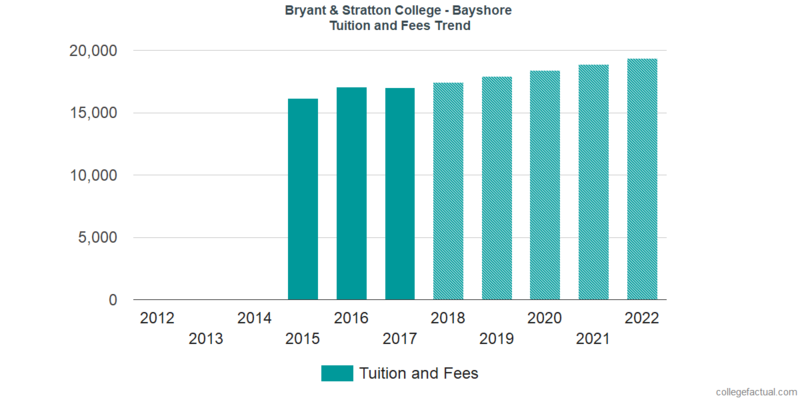 The following chart shows predicted future fees and tuition for undergraduate students at Bryant & Stratton College - Bayshore. Be aware of how much college fees and tuition is increasing every year. At many schools students will end up spending more money on their final year of college than they did for their first. Learn some answers to the most frequently asked finance questions on college.